At Carolina Sporting Arms, we specialize in firearms. Almost every product we sell is used either directly in the shooting sports or in the cleaning, care, or storage of firearms. we don’t have camping supplies; and we don’t carry team apparel. We are firearms experts and are totally dedicated to promoting firearm safety, responsibility, and proficiency. We carry a broad selection of trusted products, including handguns, shotguns, rifles, collectibles, and tactical/military sport rifles. At Carolina Sporting Arms you won’t find cheap, unreliable budget guns, but you will find a wide-array of quality, trusted firearms at prices to fit almost any budget – what we call Good, Better, and Best in class. We also carry an extensive inventory of rare and collectible guns for those who want to add to their personal collection or pursue the investment value of an extraordinary firearm. Our knowledgeable and experienced staff has decades of firearms expertise, and their mission is to provide our guests with the best possible experience, with an emphasis on gracious service. We have experts in handguns, collectibles, tactical firearms, and shotguns – just to name a few. Our team members are passionate about our products and will provide the personal attention and expert consultation you need for your next firearm purchase. From security bollards fashioned to look like shotgun shells, to our clean, spacious, well-lit showroom, when you walk through the door of our South Boulevard location, you can tell that Carolina Sporting Arms is a different kind of gun store. Whether you are a beginner or an experienced sportsman, our modern indoor shooting range offers our guests a clean, comfortable, and safe environment in which to practice your marksmanship. Featuring 14 heated and cooled lanes, an advanced ventilation system, and NRA-certified range safety officers, our range is the best place in the area to sharpen your skills. We recognize that buying your first firearm can be a daunting proposition at first. That’s why Carolina Sporting Arms’ experienced staff is committed to spending whatever time is necessary to understand your needs, answer your questions, and recommend the right gun for you. We also offer a training program featuring a building block approach from your initial orientation, through your first shots, to an introduction to self-defense. Shooting your firearm is very different than just holding it. 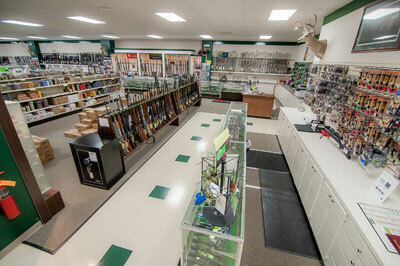 At Carolina Sporting Arms you can shoot your handgun before you buy it. With our “12 for 12” offer, $12 gets you 12 items, 10 bullets, a target, and range time. This offer to try before you buy is not just for our over 100 rental handguns, but includes our 750 plus handgun inventory. Each “12 for 12” participant will be accompanied by a certified range safety officer to answer any questions they may have. Participants will need to register with the range and supply all safety items required for shooting in the range. Every new gun purchase comes with a complimentary First Steps class. We walk you through how to hold, load, and unload the gun. We cover basic operation, how to point it, and how to aim it. We also provide a free hour of range time with every gun we sell. We are committed to promoting firearm responsibility, education, and training. In addition to the First Steps class, Carolina Sporting Arms also offers our First Shots class that takes your knowledge to the next level with a combination of classroom instruction and instructor-led shooting on our range. Our Defensive Handgun class takes your skills even further, teaching you the basics of how to use a handgun in self-defense. We also offer an eight-hour firearms safety course to satisfy the training requirements for a North Carolina Concealed Carry Permit. Because we want to make sure our guests have a great experience, service after the sale is part of our culture at Carolina Sporting Arms. When you buy a gun from us and have a problem, we have experience gunsmiths on staff that can diagnose and repair most problems onsite. If we can’t fix it in house, we will ship it at our cost to the manufacturer.